Central Park is particularly beautiful with a fresh layer of snow frosting the benches and carpeting the ground. There's a special hush in the air, and something magical in the Park's glinting whiteness. Speaking practically, though, snow also requires a great deal of extra work for Central Park Conservancy staff as we work to keep the Park safe and accessible. Before temperatures even begin to drop, the Conservancy is preparing for winter in Central Park. Here are a few of the steps we take each year. Cleaning up leaves: About 630 of the Park’s 843 acres need to be cleared of leaves before the season’s first snow. Most of the leaves are mowed into mulch and left on the ground to enrich the soil. Others are raked, picked up by hand, composted, and recycled back into the Park. 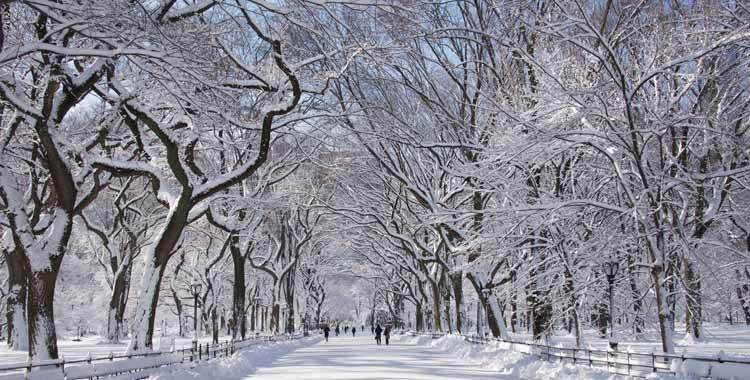 Preparing for a season of snow: Central Park has 58 miles of pedestrian paths that may need to be cleared of snow on short notice. Staff prepare snowplows, snow brooms, and snow throwers — that way, we’re ready for action at a moment’s notice. We also perform ice mitigation, an almost daily chore in the winter as snow melts and ice forms on the paths. Draining water from the Park: Central Park has multiple irrigation systems that support its lawn sprinklers, playground water features, drinking fountains, restrooms, and more. These systems are close enough to the ground’s surface to be susceptible to freezing, so they must be drained of water before temperatures fall too low. This is why all ornamental fountains and most drinking fountains are turned off during the winter. Restrooms that aren’t heated also close for the season. In 2015, the Conservancy began taking the official New York City snow measurements in Central Park for the National Weather Service. Although the Conservancy takes the measurements, the National Weather Service is responsible for totaling, recording, maintaining, and sharing all snowfall data for the Park. According to the NWS, snowfall reports for Central Park provide one of the longest continuous sets of weather data in the country, dating back to 1869. Before coming to Central Park during a snowstorm or blizzard, check our Twitter page for updates about the Park’s status. You can also follow NYC Parks and the NYC Office of Emergency Management for updates about Citywide closures. Never go out on the ice of ANY Central Park water body, and don’t let your dog go out either! Falling into frigid water can cause life-threatening hypothermia within minutes. Please leave the red ice ladders in place, as these should only be handled by emergency personnel. If you see someone in danger on, in, or near a Central Park water body, call 911. Some Central Park restrooms are closed during the winter season. These include the facilities at Merchants’ Gate (West 61st Street), Bethesda Terrace, the Great Hill, and Robert Bendheim Playground. Some restrooms are maintained by other organizations, and may be closed due to snowfall without notice. These include the facilities at the Arsenal, Le Pain Quotidien (Mineral Springs), Tavern on the Green, the Kerbs Boathouse at Conservatory Water, the Loeb Boathouse, and the Tennis House. Visit our restrooms page for more details. With the cold temperatures, bare trees, and picturesque snow, winter is a beautiful and peaceful time of year to explore New York City’s backyard. When covered in snow, Central Park is a great place to enjoy sledding, cross-country skiing, and snowshoeing. You can also go ice skating at Wollman Rink and Lasker Rink. For even more ideas of how to enjoy this season, explore our list of 20 ways to spend a winter day in the Park.